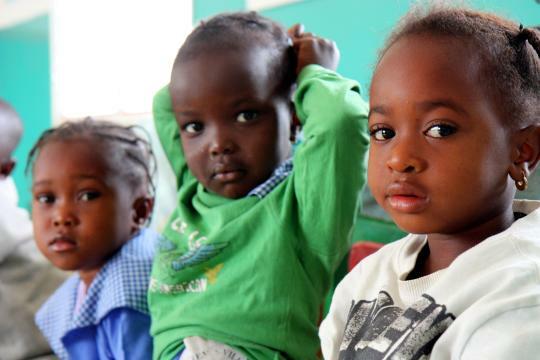 In The Gambia, SOS Children's Villages started its activities in the 1980s. Because of the impoverishment of many Gambian families, a growing number of children end up without parental care, fending for themselves. Frequently occurring natural disasters worsen the living situation of the poorest population segments in this small African country. The Republic of The Gambia has a total population of 1.7 million, of which approximately 440,000 live in the capital city of Banjul. Until 1965, The Gambia was a British Crown Colony called “British Gambia” and Gambian troops even fought with the Allies during World War II in Asia. Since gaining independence in 1965, The Gambia has been marked by relative political stability, despite a bloodless military coup in 1994 in which the elected government was toppled. After the coup, a new constitution was introduced and presidential elections were held in 1996, securing the country's return to civilian rule. The Gambia is characterized by an impressive ethnic diversity. In addition to the official language English, the tribal languages Mandinka, Wolof and Fula are widely spoken. Islam is the predominant religion. The Gambia relies on subsistence farming, as natural resources in this fairly little country are scarce. The main export commodity is peanuts. The Gambia is not only one of Africa's smallest nations, it is also one of the poorest. Adding to its persistent economic problems, The Gambia has recently been facing natural disasters. In 2010, floods destroyed many homes and left thousands of Gambians homeless. Most private homes located in lowland areas or near waterways collapsed. The disaster occurred during the peak farming season and therefore caused food shortages as crops were largely destroyed. 29 per cent of the population is chronically undernourished and floods make this problem even worse. For those who find themselves on the lowest rungs of the socioeconomic ladder, access to regular meals and drinking water often proves difficult. Around one in five infants in The Gambia is born with low birth weight. The availability of medical personnel remains limited: only about half of all births in The Gambia are attended by skilled nurses. Other pressing problems include a low life expectancy at birth of only 63 years and a comparatively high under-5-mortality rate of 98 per 1,000 live births. Diarrhoea, malaria and other infectious diseases are considered substantial public health issues. Due to the floods, the number of people affected by these diseases has been on the rise. Although poverty can also be found in urban centres, in rural or semi-rural areas of the country more than 60 per cent of the population are classified as poor. The principal causes of rural poverty in the Gambia include low and decreasing soil fertility, low agricultural productivity and generally low prices on world markets for products such as peanuts. Gambia has a very young population: around 40 per cent of Gambians are less than 14 years of age. Around one fourth of Gambian young people engage in child labour activities because of the economic situation of their families. Poor children in Gambia are less likely to attend school on a regular basis, receive fewer years of education and are more likely to suffer from malnutrition and infectious diseases. Many of these children never get to experience true childhood, especially those who grow up in single-parent households. Only 67 per cent of school-aged children in Gambia are enrolled in primary school. Tens of thousands of young girls in Gambia continue to be victims of female genital mutilation which is still commonly practiced in this country. It is evident that these cruel methods lead to substantial physical and psychological health risks for the girls. These risks may include infertility, urinary incontinence, all sorts of infections and severe complications at childbirth. When compared to many other African countries, the HIV prevalence rate for Gambia is categorised as low. Nonetheless, there are concentrated areas where HIV/AIDS remains a persistent and predominantly female health problem. Early sexual activity and marriage at a young age - sometimes forced - are the reasons why girls account for the highest share of HIV infections. 1980 was the year when SOS Children's Villages became active in The Gambia. Due to extreme poverty and the break-up of traditional family structures, a growing number of children ended up in the streets, looking after themselves. In 1981, SOS Children's Villages started its activities in Bakoteh, approximately 18 kilometres from the capital Banjul. 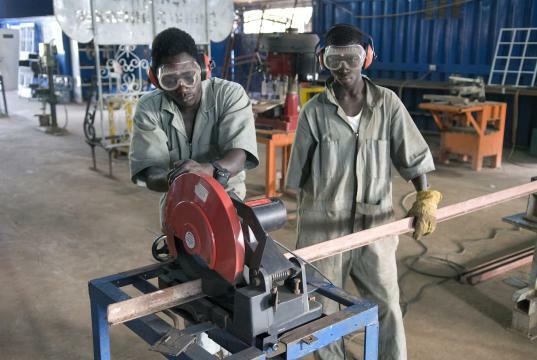 Against the background of poor education systems in the region, some students at the SOS Vocational Training Centres also come from Liberia and Sierra Leone to receive their technical training courses. Since the economic situation in Gambia has been rather turbulent, SOS Children's Villages also supported the population in surrounding neighbourhoods during emergency situations, for example by building houses for impoverished families. At present, the organisation operates two SOS Children's Villages in the Gambia. We have been supporting Gambian children and young people by providing day-care, education, medical services and vocational training. Our aim is to strengthen existing family ties and enable children who are at risk of losing parental care to grow up within their own family. Children who cannot be taken care of by their own family can find a loving home in one of the SOS families.